Pandit Banarsidas was a great poet and spiritual scholar of the seventeenth century. He was accomplished, both in the fields of poetry and spiritualism. He was born on Sunday, the eleventh day of the second half of Magh month, in the Shrimal dynasty at Lala Kharagsen's house. He was then named Vikramjeet. While on a pilgrimage of Banaras, he was named Banarsidas after the birth place of Bhagwan Parshwanath. He was the only son of his parents. Like autumn trees, remained just the bare. He did not lose his patience even in such difficult circumstances, since was self realised magnanimous person. Banarasidas was founder of Spiritual Revolution, known as Terah-panth and threw away Bhattarak-way, which had eclipsed true Jainism. 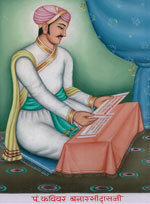 Later, when Acharya-kalp Pandit Todarmal touched upon this Revolution, it spread in the entire north India. He was a born poet. At the age of fourteen he began to compose verses of a high order, but in his early life he wrote verses on love and romance. His first work 'Navras' was ready when he was barely fourteen. This contained poems of a corporeal nature. It was an important work on corporeal subjects. However, the poet threw it in the river Gomati, when spiritual wisdom dawned upon him. After that all his life was full of spiritualism. Four works written after that are available viz. Banarsi Vilas, Nam Mala, Ardha-Kathanak and Natak Samaysar. Ardha-Kathanak is the first autobiography of the Hindi language and is a fully developed work of art. The fifty-five years of the life of the poet have been described in it, as in a looking glass. A must read. Natak Samaysar is in a way a poetic translation of the verses of Amrit-chandracharya. However, due to the keen insight of the poet, the study of this book gives delight as that of an independent work. This book is full of spiritualism. The poet is unmatched both, in his poetic art and the pursuit of truth.